Hiya guys! Just another snowy cold day in Jersey. I cannot believe this is still a thing, but it is and I am freezing my nails off. Today I'm sharing swatches for the N'Sync Collection by Anchor & Heart Lacquer and Supermoon Lacquer, which consists of four gorgeous shades inspired the bands debut album. This is definitely a blast to the past for me and my inner tween has fangirled herself into a frenzy. You best believe I was listening to the album as I swatched this collection, haha. In fact, you guys should probably play it in the background as you read this post. Hit that play button and let's get into the swatches! The Nsync Edition Quartet, plus the bonus LE, will be available for pre-order Thursday, March 22nd at 6PM CST in the Supermoon Lacquer shop. Pre-order will conclude on Tuesday, March 27th at midnight CST and will have an estimated TAT of 3-4 weeks. Each full-size shade will retail $11 or the quad can be purchased as a set for $40. The bonus shade, It’s Taryn Up My Heart, can be purchased for $10. International shipping available for Canada, Australia, the Netherlands, and the United Kingdom. 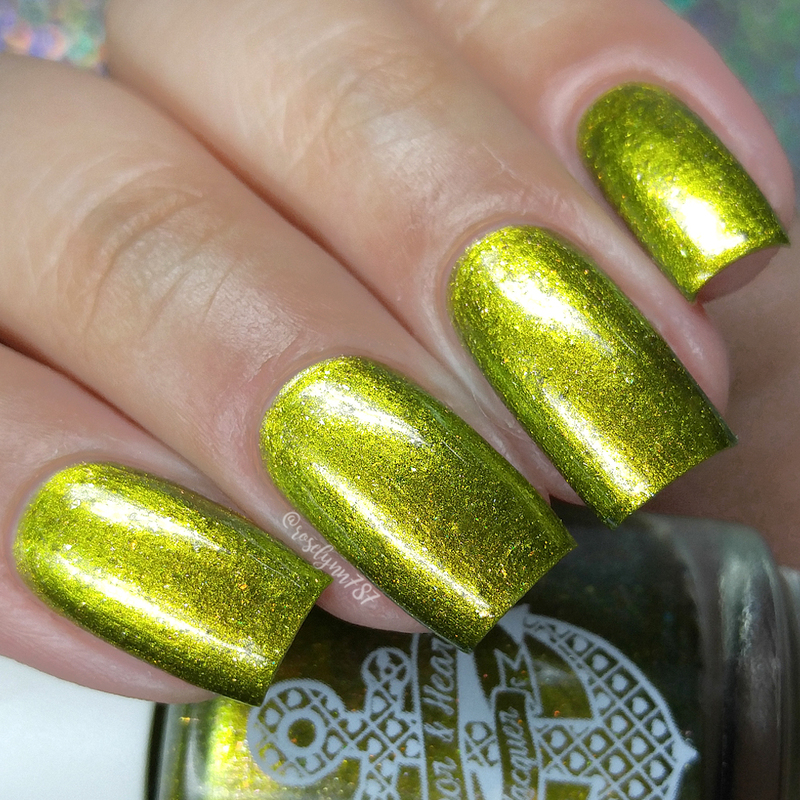 Drive Myself Crazy can be described as a vibrant yellow base with a green/yellow/gold multichrome shift. It's accented by orange/pink/gold shifting flakies, and a sprinkle of gold holo micro glitter. Wowza! We are starting off this review with a hue that is here to knock your socks off that's for sure. It's so bright, fun, and definitely the most unique color in my collection. All I can think about is the super summer 90s vibe this shade is bringing. That said, it's not a color that's easy to pull off against my skin-tone. I honestly didn't think it would mesh well, but after swatching it I ended up having hearts for eyes as I stared at it haha. 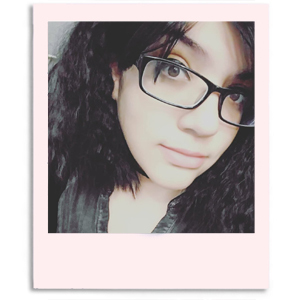 I really ended up liking how well it worked and I think it'll be one of my go-to shade this summer. This song was one of Taryn’s favorites from their debut album and it accompanied much of her teenage angst. The bright yellow base is a loving nod to Justin Timberlake's infamous "noodle hair". The formula has a good opacity throughout the application. Consistency is well balanced, not too thick or too thin. I did feel like the finish wanted to cling onto any imperfections on my nail bed, so a base coat is a must in order to have a silky look. There are some minimal brush strokes in the finish during the application, but they do blend out as it dries. And it dries down to a minimal gritty finish that smooths out perfectly after topcoat. Shown in two coats and sealed with a glossy topcoat. I Want You Back can be described as a dark teal-blue scattered holographic with green/blue/gold chameleon shimmer, green-to-blue and gold-to-green color shifting shimmer, white, blue, and green sparks, blue pearl flakies, iridescent blue/purple and green/teal micro-glitters, and iridescent and silver holographic micro-glitters. The teal queen known as Mardi is here to kill us with her stunning creations once again. Seriously, how many teals does one girl need? The answer is simple... as many as Mardi keeps making, haha. The color has a stunning complexity due to the combination of shimmers and their shifts. Definitely one of those colors that makes you feel like you could drown in it. Inspired by Nsync’s debut, first ever single and one of Mardi’s favorite songs. Polish color is inspired by the American version of the song’s music video. The formula has a really opaque application though not quite enough to be a one coater. The consistency leans a bit on the thick side, but it's manageable and easy to work with. Lots of sparkle and holo flame, much more than captured by photos. It dries down to a minimal gritty finish that smooths out after topcoat. I did experience some minimal staining to my cuticles on removal, but there was none to my nail beds (though it should be noted they were on for under two hours). Shown here in two coat and sealed with a glossy topcoat. A Little More Time On You can be described as a magenta scattered holo with shifting red/gold shimmer, and a playful mix of shifting flakies in various types, colors, and finishes. Oh my, how freaking fun does this one look?! I love a bit of variety in a collection and A&H pulled through strong here. The finish has a bit of everything while not being overwhelming whatsoever. It's the perfect blend and looks surprisingly great against my skin-complexion. I normally don't go for anything pink, but again this brand has won me over on something I wouldn't typically go for. The music video depicts a black and white montage of a mother and her son as he travels through childhood to adulthood. Taryn chose purple to represent the wisdom, dignity, and magic of motherhood, while the colorful flakies and shimmer represent the many complicated emotions portrayed in the relationship between mother and child. The formula has a really sheer application that builds up evenly for full coverage. Consistency wise it leans a little on the thin side, but that actually ends up working perfectly for a flakie filled finish. Each brush stroke has ample flakies that spread nicely across the nail without clumping. It dries down to a textured finish and I doubled-up on the topcoat for a smooth finish. Removal was pretty easy as well, I wore this shade for over 24 hours and didn't need to soak. Shown here in three coats and sealed with a glossy topcoat. You Got It can be described as a bright periwinkle blue base with gold sparks, blue/purple/copper/magenta chameleon shimmer, red-to-yellow and magenta-to-gold color shifting shimmer, bright red-to-gold color shifting aurora pigment, rose pearl flakies, and red-to-gold color shifting flakies. Here's another very punchy, 90s, summer shade to get you in the right vibe for some sunshine. I love, love, love how vibrant a lot of these shades have been in this collection. While never released as an official single, this is Mardi’s favorite song off of Nsync’s debut album and she used the colors from the album’s cover as inspiration for the polish. The formula has a very opaque application that barely needs more than a coat for full coverage. Consistency on point and perfectly balanced throughout. So smooth and very creamy nature to the finish. The shimmer is on the subtle side, but works well against the popping color of the base. It dries down to a smooth high-shine finish on its own. Get shook because this pigmented beauty caused no staining on removal to my cuticles or nail beds. Shown in two coats and sealed with a glossy topcoat. It’s Taryn Up My Heart can be described as a teal green scattered holographic with turquoise shimmer, green-to-blue color shifting shimmer, blue and white sparks, and iridescent rainbow micro-glitter. 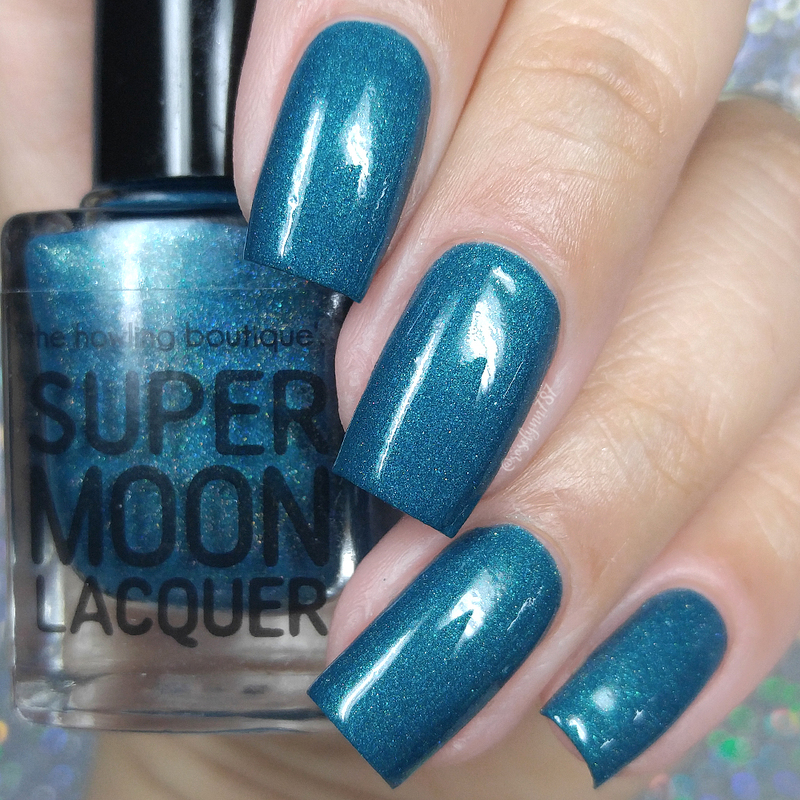 I'm so beyond thrilled to see this shade make a return and you guys should be too! Before I say anything else, it's a must-have. 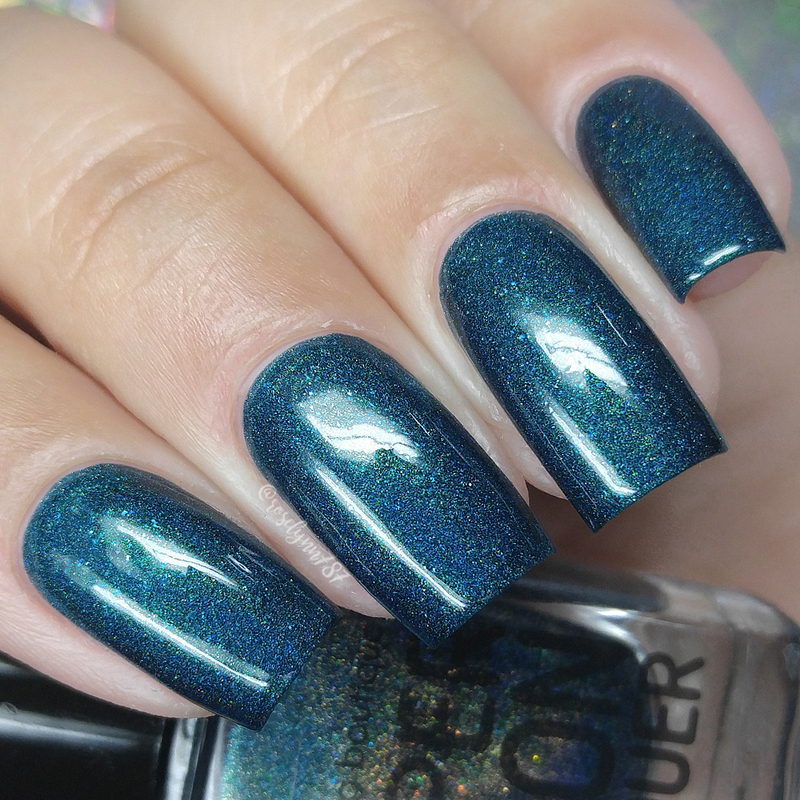 It's the perfect shade of teal to be worn year round no matter the holiday or season. The finish has a gorgeous shimmer that adds so much depth to an otherwise straight-forward color. Plus it's stunning against any skin-complexion! 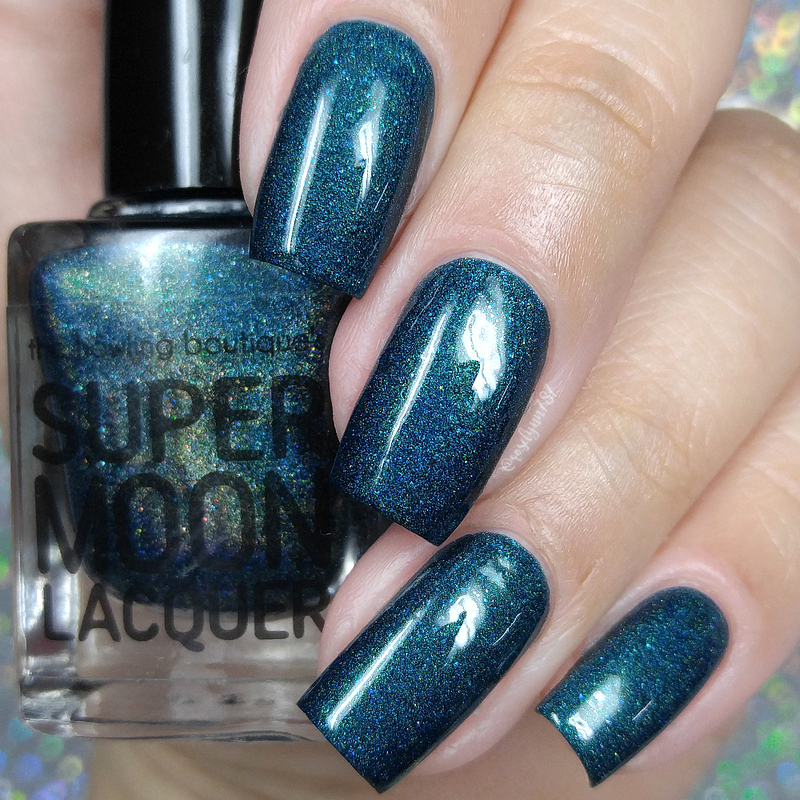 This is a re-release of Supermoon Lacquer’s first ever limited edition polish originally available in July 2016. 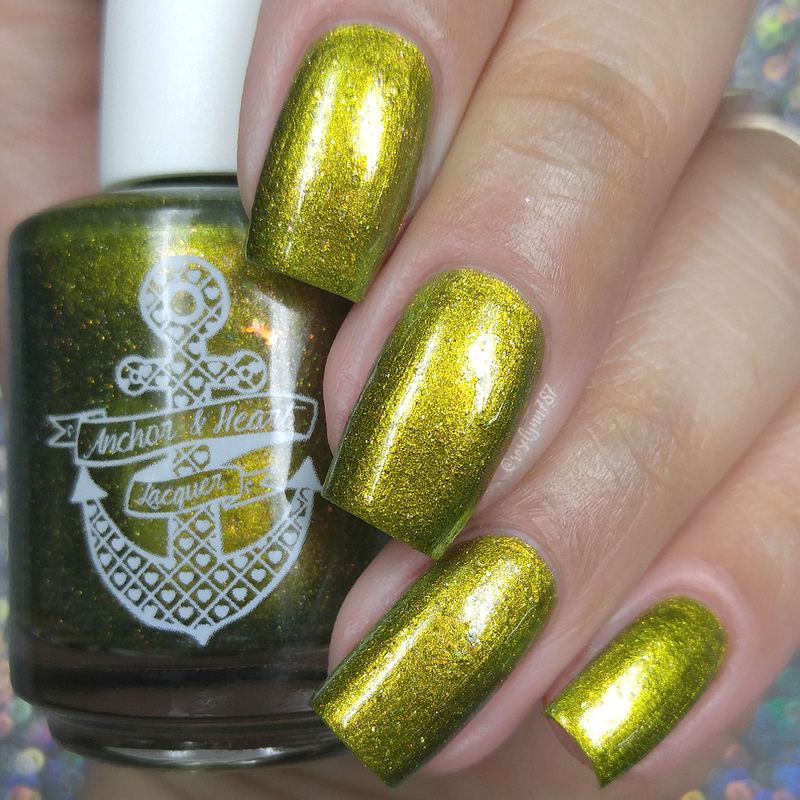 Dedicated to one of Mardi’s very first fellow maker friends, Taryn of Anchor & Heart Lacquer. The name is a play on the Nsync song ‘Tearin’ Up My Heart’. The formula has a very opaque application and can be an easy one coater. I opted for a thin second coat only for a touch more holo and shimmer in the finish. The consistency has a perfectly balanced nature, not too thick or too thin. It's so easy to work with and apply, smooth as butter. It dries down to a minimal gritty and semi-satin finish that smooths out after topcoat. And I'm thrilled to say I experienced no staining on removal to either my cuticles or nail beds. Shown in two coats and sealed with a glossy topcoat. 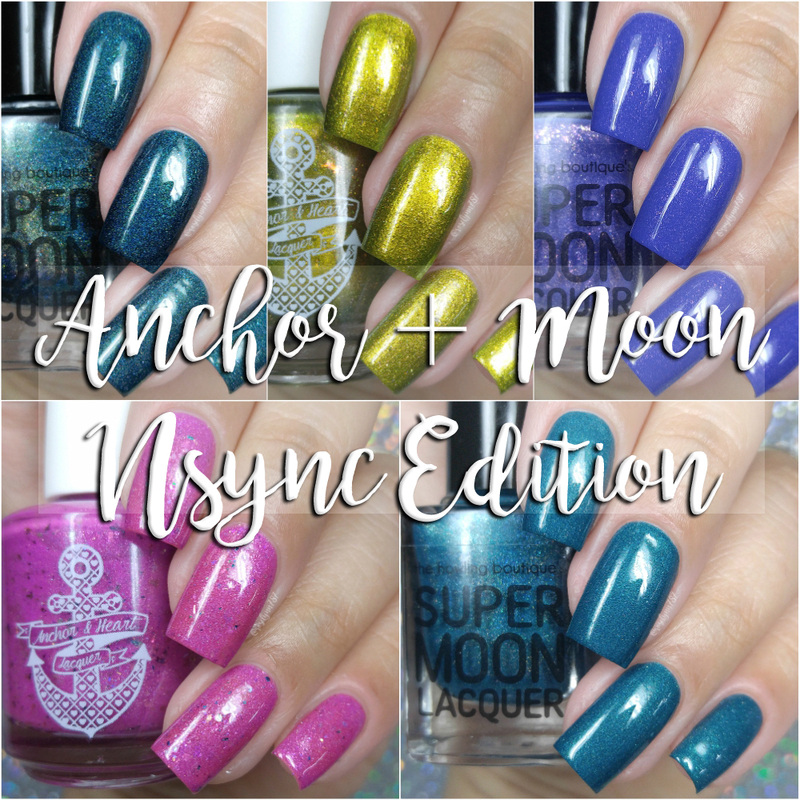 To recap, the Nsync Edition Quartet, plus the bonus LE, will be available for pre-order Thursday, March 22nd at 6PM CST in the Supermoon Lacquer shop. Pre-order will conclude on Tuesday, March 27th at midnight CST and will have an estimated TAT of 3-4 weeks. Each full-size shade will retail $11 or the quad can be purchased as a set for $40. The bonus shade, It’s Taryn Up My Heart, can be purchased for $10. International shipping available for Canada, Australia, the Netherlands, and the United Kingdom.